Batman TMNT is here! Does the crossover live up to the hype? Behemoth concludes its first arc. We talk with artist J.K. Woodward, and writer Chris Kipiniak. We discuss the new TMNT 2 trailer, Supergirl, Agents of S.H.I.E.L.D., Flash, and Arrow. Plus we announce the winners of our signed Paybacks books, answer important questions for our viewers such as: Should Marvel make a Spider-Man TV series, and FMK Martha Stewart, Paula Deen, or Kathy Lee! All this and the best Christmas kick-line this side of the East River. Don't delay! Download today! 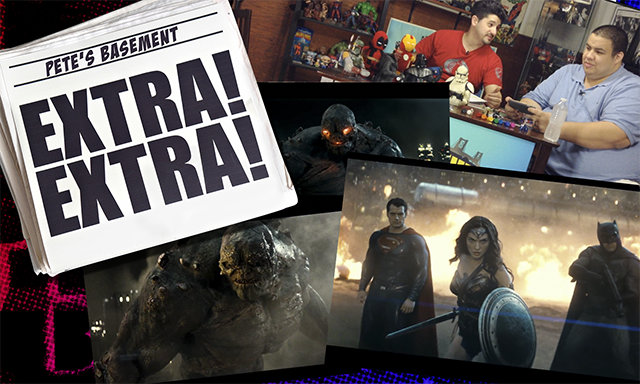 Batman v Superman Trailer In-Depth Reaction & Review from Pete's Basement! 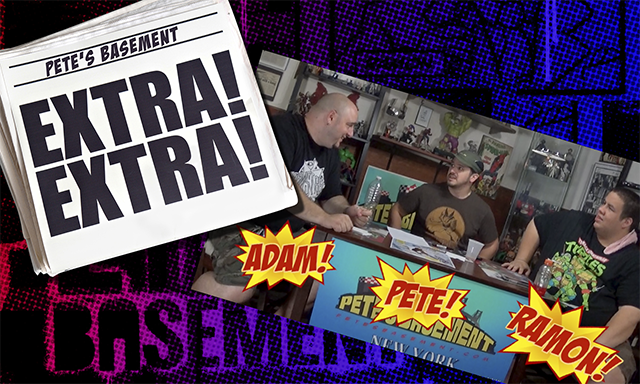 Batman v Superman Trailer 2 Reaction Video from Pete's Basement! Cheeseburger returns triumphant from the Year of the Locust tour! Pete and Ramon discuss Agents of S.H.I.E.L.D., Goonies 2, and Watchman on HBO. Plus we kick off Pizza Month with a pie from Grandma Roses. Justice League is the surprise hit of a week full of good books, including Ghostbusters Get Real, Headlopper, and lots more! And it's the last week before New York Comic Con! We talk about what we're looking forward to, and which after parties we'll be attending. Go on, get to downloadin! It's Pete's Basement's labor Day weekend party, and Pete decides what better way to celebrate than by eating the hottest pepper this world has to offer: The Carolina Reaper. But before the madness can begin, the boys talk about a few great books from the week, such as Toil and Trouble, a take on Shakespeare's Three Witches from Macbeth, as well as Vampirella fighting off Aliens, and Deadpool going to head to head against Thanos! There's also the Misty Knight casting and Tony Todd as Zoom! Hit the play button and watch the crazy!